Status: Deceased; Active 1965-1989. Born: 1935-09-05. Died: 2012-07-31. Birth Place: Bakhmach. Graduated from Military Engineering School in Moscow with an electronic engineering degree, 1956 Leader of shift in the satellite control facility of Soviet Ministry of Defense. Cosmonaut training November 1965 - December 1967. Deputy Director of Moscow Memorial Museum of Cosmonautics (Korolev Museum). Died in Zvyozdny Gorodok, Russian Federation. Family: Cosmonaut. Country: Ukraine. Flights: Soyuz 21, Soyuz 23, Soyuz 24, Soyuz 25A. Agency: VVS. Bibliography: 4452. 1935 September 5 - . Birth of Mikhail Ivanovich Lisun - . Nation: Ukraine. Related Persons: Lisun. 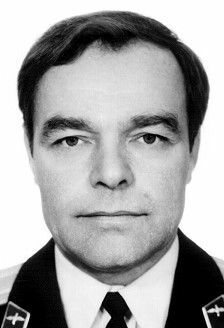 Ukrainian engineer cosmonaut, 1965-1989..
2012 July 31 - . Death of Mikhail Ivanovich Lisun. - . Related Persons: Lisun. Ukrainian engineer cosmonaut, 1965-1989..